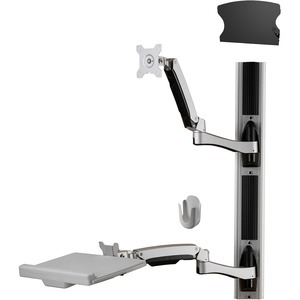 This Amer Combo Wall Mount Workstation System provides an ergonomic and convenient method to create work efficiencies and maximum space utilization. Designed with an extended arm to hold the display and a second arm for the keyboard tray, this sit-stand wall mount system allows for easy collaboration and high flexibility in both function and ease of use. The Mount system comes with a CPU wall mount holder to allow for the easy storage and accessibility of the main processing unit and a mouse holder to keep the station neat and organized.